India, according to Dr.V. Raghavan, retired head of the Sanskrit department of India's prestigious University of Madras, was alone in playing host to extraterrestrials in prehistory. Dr. Raghavan contends that centuries-old documents in Sanskrit (the classical language of India and Hinduism) prove that aliens from outer space visited his nation. "Fifty years of researching this ancient works convinces me that there are livings beings on other planets, and that they visited earth as far back as 4,000 B.C., " The scholar says. "There is a just a mass of fascinating information about flying machines, even fantastic science fiction weapons, that can be found in translations of the Vedas (scriptures), Indian epics, and other ancient Sanskrit text. "In the Mahabharata (writings), there is notion of divine lighting and ray weapons, even a kind of hypnotic weapon. And in the Ramayana (writings), there is a description of Vimanas, or flying machines, that navigated at great heights with the aid of quicksilver and a great propulsive wind. 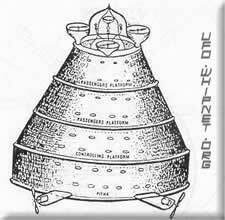 "These were space vehicles similar to the so-called flying saucers reported throughout the world today. At Rama's behest, the magnificent chariot rose up to a mountain of cloud with a tremendous din. Another passage reads: "Bhima flew with his Vimana on an enormous ray which was as brilliant as the sun and made a noise like the thunder of a storm." In the ancient Vymanka-Shastra (science of aeronautics), there is a description of a Vimana: "An apparatus which can go by its own force, from one place to place or globe to globe." Dr. Raghavan points out, "The text's revelations become even more astounding. Thirty-one parts-of which the machine consists-are described, including a photographing mirror underneath. The text also enumerates 16 kinds of metal that are needed to construct the flying vehicle: "But only three of them are known to us today. The rest remain untranslatable." Another authority who agrees with Dr. Raghavan's interpretations is Dr. A.V. Krishna Murty, professor of aeronautics at the Indian Institute of Science in Bangalore. "It is true," Dr. Krishna Murty says, "that the ancient Indian Vedas and other text refer to aeronautics, spaceships, flying machines, ancient astronauts. "A study of the Sanskrit texts has convinced me that ancient India did know the secret of building flying machines-and that those machines were patterned after spaceships coming from other planets." The Puspaka car that resembles the Sun and belongs to my brother was brought by the powerful Ravan; that aerial and excellent car going everywhere at will.... that car resembling a bright cloud in the sky.".. and the King [Rama] got in, and the excellent car at the command of the Raghira, rose up into the higher atmosphere."